Condor Flugdienst (Frankfurt) is planning to start new long-haul service from Munich commencing in June 2016 according to Airline Route. The carrier will add weekly flights to Cancun (starting on June 6, 2016), Halifax ( June 3, 2016), Havana (June 4, 2016), Windhoek (June 29, 2016) and Zanzibar-Mombasa (June 21, 2016). The new routes will be operated with Boeing 767-300s. Copyright Photo: Arnd Wolf/AirlinersGallery.com. 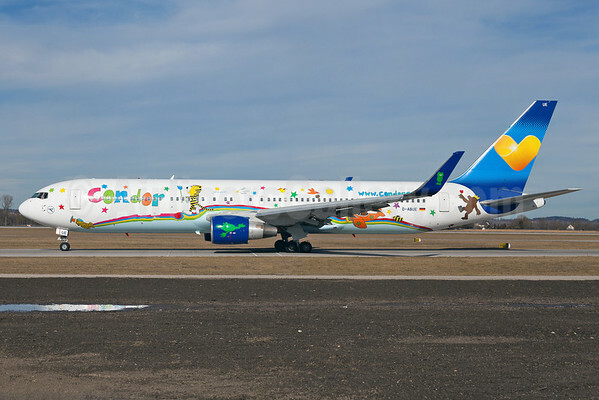 Boeing 767-330 ER D-ABUE (msn 26984) taxies at the Munich with the special “Janosch and Condor support a Heart for Children” and “Sunny Heart” livery. This entry was posted in Condor and tagged 26984, 767, 767-300, 767-330, Boeing, Boeing 767, Boeing 767-300, Cancun, Condor, Condor Flugdienst, D-ABUE, Halifax, havana, Mombasa, MUC, Munich, Windhoek, Zanzibar on June 30, 2015 by Bruce Drum.